Despite the fact that 2017 saw a flurry of devastating and “record-shattering” hurricanes, enormously destructive wildfires, and extreme droughts, a new report by Public Citizen published on Friday concludes that major American media outlets “largely failed” to connect these weather events to the broader global climate crisis. Titled “Carbon Omission: How the U.S. Media Underreported Climate Change in 2017” (pdf) and written by Public Citizen’s climate program director David Arkush, the analysis takes an in-depth look at the 2017 weather coverage of more than a dozen prominent newspapers and television networks, from the New York Times to the Denver Post to the Fox News Network. “Given the gravity and urgency of the climate crisis, as well as a surfeit of relevant, newsworthy developments, one would expect U.S. media to report on climate and clean energy issues daily,” Arkush writes at the outset of his report. However, a closer look revealed that more often than not last year, the opposite was the case. 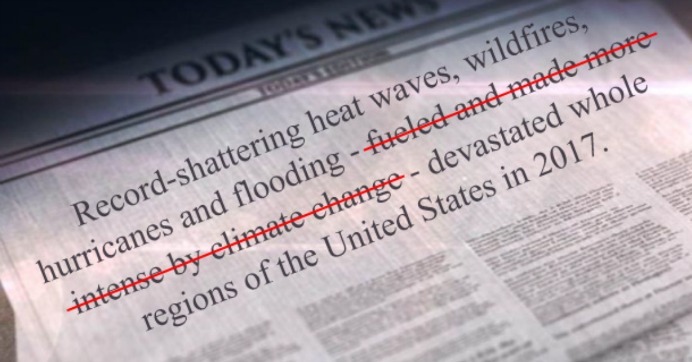 While coverage of hurricanes, wildfires, and other major weather events frequently dominated newspaper headlines and television segments in 2017, the “proportion of pieces that mentioned climate change in climate-relevant contexts was decidely low,” Arkush writes—even though scientific research has frequently demonstrated the link between climate change and extreme weather. Extreme weather throughout the U.S. and across the globe over the past several months led one analyst to call 2017 “the year climate change began to spin out of control,” but the media’s failure to “connect the dots on evidence right in front of our faces” has left many consumers of U.S. news uninformed about the link between climate change and these disastrous events, Arkush argues. “We’re talking about the greatest challenge of our time,” he writes. This entry was posted in Climate Change & Environmental Issues, Media Issues and tagged Climate Change, Environment, EPA, Media Issues, Public Citizen, Scott Pruitt on January 6, 2018 by MNgranny.